On episode 284 of the Hop Cast, Brad Chmielewski and Ken Hunnemeder are joined by Brad Stark. 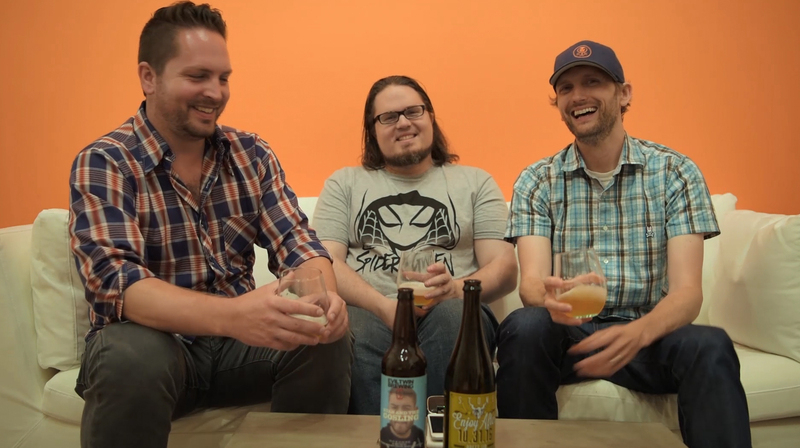 Stark has been on the show a number of times and it’s good to have him back to help talk about these Brett beers. First up the guys open up the Ryan And The Gosling, a collaboration beer between Evil Twin and Crooked Stave. It’s been a while since any of the guys had an Evil Twin beer, which is sad because they are always doing some interesting things. This 4.0% ABV beer was brewed at Westbrook Brewing Co ., It’s a 100% brettanomyces with citrus peel and with citrus juice added. Following that good looking beer, the guys move onto another they should have saved for a little longer. But saving beer isn’t all that fun, it’s way more fun to drink it. The Stone Enjoy After Brett IPA says to enjoy after 10.31.16. This is a Brett IPA, a style that hasn’t been as popular in the last couple years but we used to see more often. It says that this beer won’t be fully carbonated until that date on the bottle but the flavor is great. It would be interesting to see how this beer tastes after the date, so if you can hold onto it, do but don’t feel bad if you decide to pop the bottle early. Having issues listening to the video? Try the Quicktime (1000 MB) or subscribe to the podcast on iTunes or Stitcher.